In response to a request from a group of artists at Menlo Park Presbyterian Church, the topic my next two posts is Light as a Biblical Metaphor. I will explore how the authors of Scripture use the physical reality of light to illuminate spiritual realities. To start, we need to know that light is a significant metaphor in Scripture and the word “light” occurs on the very first and very last pages of Scripture, and more than 250 times in between. In order to enter into the way that biblical authors use light as a metaphor, we are going to spend a good amount of time reading passages of the Bible so that they can shape our imaginations. My hope is that by the end of this series we will have entered into the creative and metaphorical imaginations of the authors of Scripture. But before we launch our expedition, we must begin with the very first place in which light appears in Scripture, because remarkably, all those that follow can be derived from the truths asserted in very first verses of the Bible. This may seem like a straightforward account of physical realities of light and darkness, but it is much more than this. If you have studied the Genesis creation accounts in their Ancient Near East context you know that a lot more is going on. In the ancient world the sea and the darkness were synonymous with gods of chaos and death. 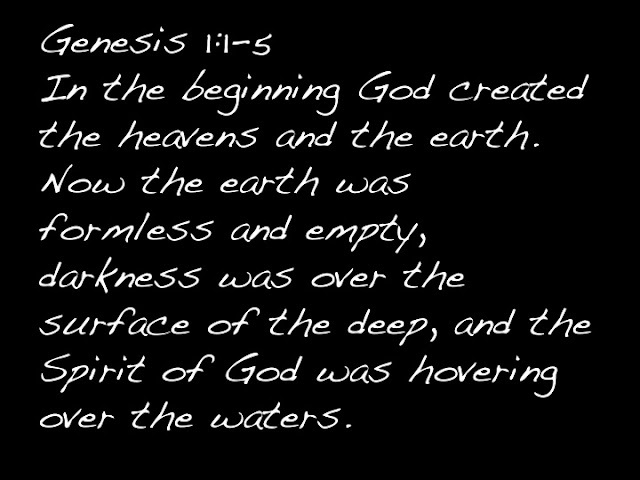 As you may know, before Genesis came Enuma Elish–and the Babylonian Creation tale was widely known. In this myth, Tiamat was the goddess of the chaotic ocean seas. That mythical epic is all about how Tiamat gets conquered. 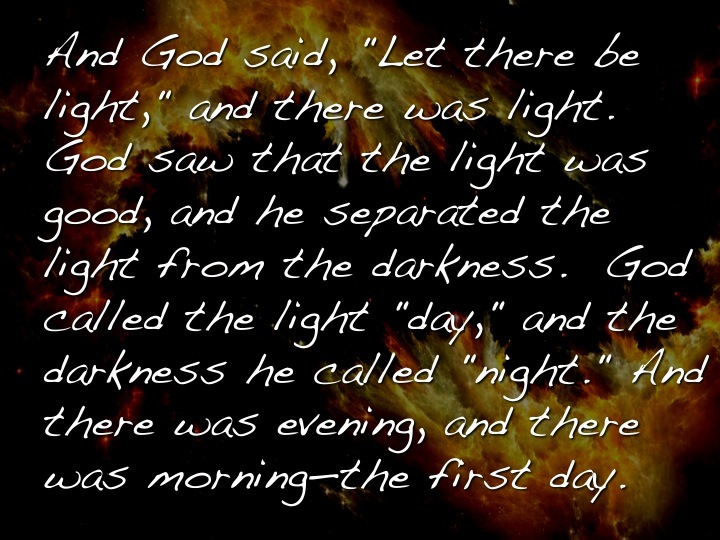 In the ancient imagination, darkness was understood to be a problem, so the creation of light and the separation of light and darkness in Genesis intends to communicate God’s dominance over (the gods of) darkness, death and chaos. This simple account contains the three primary ideas that later writers develop. So we’re going to look at each of them, how they are developed in the Old Testament and then (in my next post) we’re going to see how they are applied to Christ and God's people in the New Testament. First, God creates light as something of an antidote to darkness. Light comes from God. God does not create darkness. Darkness is an absence. It is as if darkness is what exists apart from God. Thus, darkness is a problem that needs to be contained. It is from here that the prolific concept of light and dark as good and evil is born. Darkness, of course, is not a thing in/of itself. It is the absence of light. 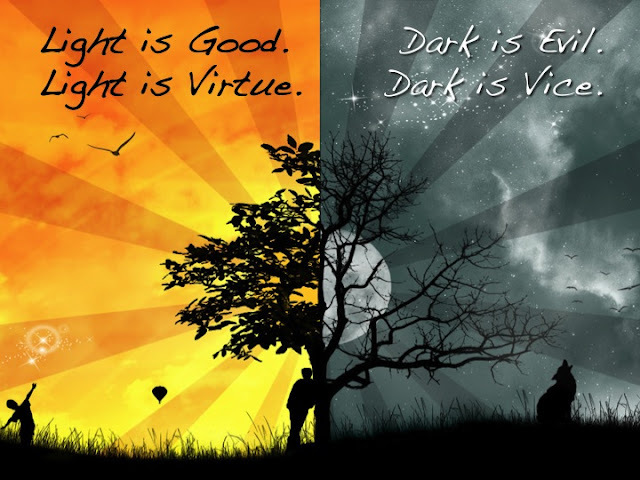 Philosophers and theologians say similar things about good and evil, evil being the absence of good. Let’s read just three Old Testament passages that draw on and develop this metaphor as light and dark and good and evil. Isaiah 51:4 Listen to me, my people; hear me, my nation: Instruction will go out from me; my justice will become a light to the nations. Second, light gives order to creation and makes life possible. Light is essential to biological life; it is necessary for life to thrive and flourish and prosper and the authors of Scripture recognize this. My wife Lindsay and I were talking about our next steps with our newborn daughter, something occurred to me that illuminates this point about light giving order to creation. Many baby books recommend that by around four months parents begin to provide a schedule of feeding and sleeping and play for our baby, a schedule of light and darkness. They say that this helps the baby begin to order their world and helps them feel secure because of that predictability. In the same way as the predictability of a routine will help our daughter to flourish, the separating and ordering of night and day allowed life to flourish on earth. If you’ve ever known someone that works irregular hours – night shifts and day shifts– you know that they don’t experience this as a flourishing way to live. The simple connection between light and life is developed thoroughly especially in the Psalms and comes to refer not just to biological life or existence, but fullness of life. 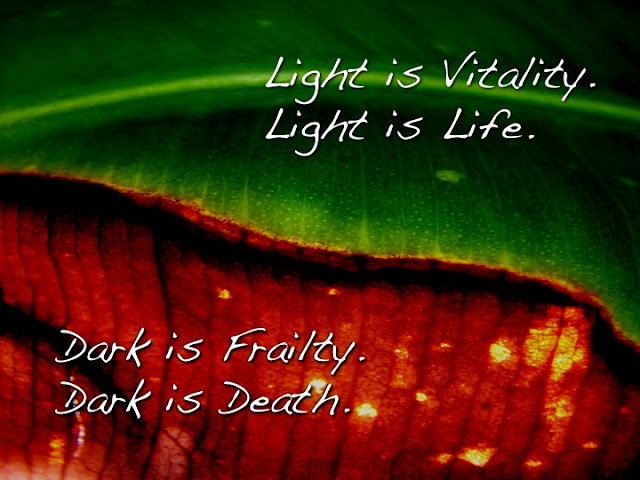 Light in life indicates vitality and prosperity. Darkness, conversely, connotes death. Third, we see in the Genesis account that it is God’s word, that it is God’s very speech that ushers in light. Light is connected to the elocution of God. For what God speaks is true and real. God's speech is light that illuminates and makes known. This concept is developed especially in Psalms as God’s Word is described as a light and a lamp. Light is a metaphor for vision, for sight and truth and knowledge and wisdom. 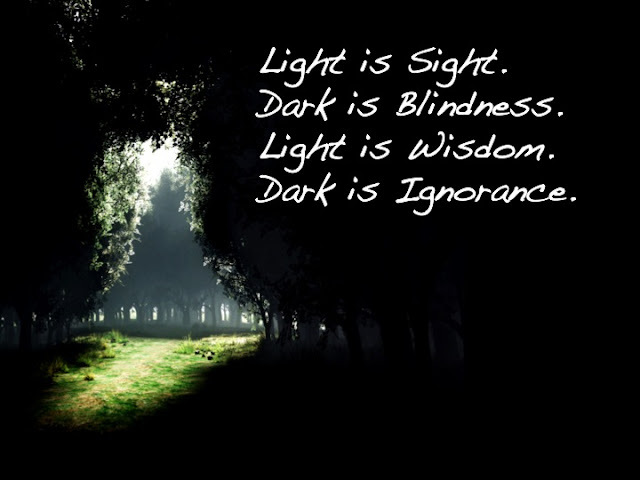 Darkness, conversely indicates ignorance and blindness. 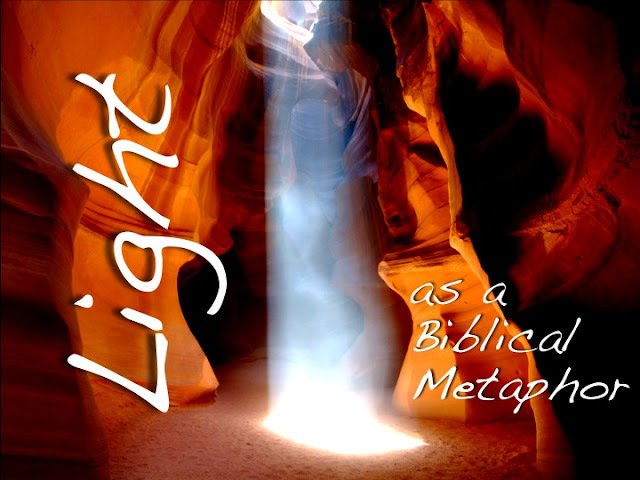 The Psalms and Isaiah are the major OT books that develop these metaphors for light. In Isaiah 10:17, they develop further and the Holy One is referred to as the Light of Israel. The idea here is that God is the source and epicenter of everything packed into the metaphor of light. God is the fountain of vision, and vitality and virtue. 1 John 1:5 God is light; in him there is no darkness at all. The concept here is that all the content of metaphorical light finds its source in God’s very being. God is the source of goodness. God is the source of life. 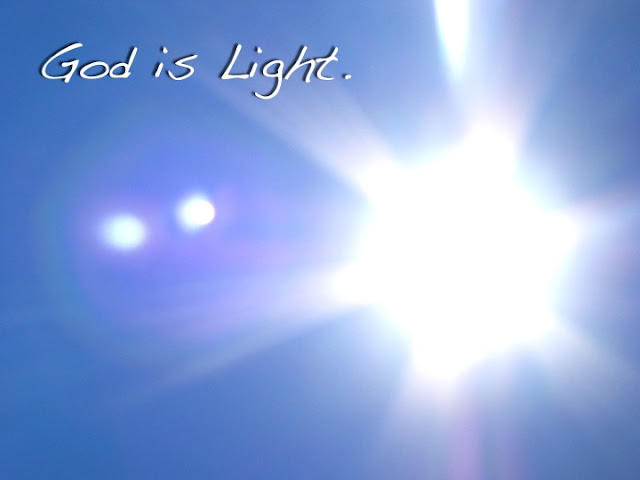 God is the source of wisdom...thus, God IS light. In the next post we'll explore how this metaphor of light is applied to Christ and his followers. Brilliant (sic)! Looking forward to part 2.